Preface - Who this book is for. Part One. Why is Bullying an important issue? 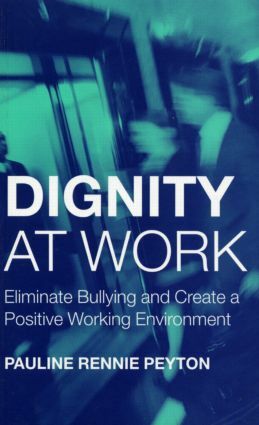 A Background to Bullying at Work, Bullying at Work, The Victims of Bullying, Employers, Harassment, Bullying and the Law, Dignity at Work Policies. Harrassment Investigation. Mediation. Conclusions for Part 1. Part Two. Introduction. The Tole of Counsellors/Psychologists in Organisations. Useful Theories. Counselling in Organisations. Working with the Various Parties. The Process of Investigation. Mediation. Other Roles for Counsellors/Psychologists. Taking Care of the Self. Pauline Rennie Peyton is an integrative psychotherapist and a chartered psychologist. Since presenting her first paper on 'Bullying at Work' in 1995, she has built a reputation as a pre-eminent expert in this field. As a consultant to organisations large and small, she assists in policy writing and implementation, training, investigating, mediating and counselling the victims and perpetrators of bullying.